Ultimate fish taco at Slapfish. Years ago, the food at LAX drove you to drink. We’d fill up on cocktails worthy of an Elk’s Lodge before suffering through a high school cafeteria-grade Mexican combo plate—but all that has changed. In addition to top L.A. institutions like Campanile, Cole’s, and the La Brea Bakery, there are excellent tacos, tortas, and tostadas to whet your appetite—it’s L.A.’s versions of getting lei’d, but in an edible arrangement. Here’s where to taste your first or last taco at LAX, depending on which way you’re headed. Slapfish is a popular chain serving up classic Americana like lobster rolls, fish and chips, clam chowder, and seafood cocktails. 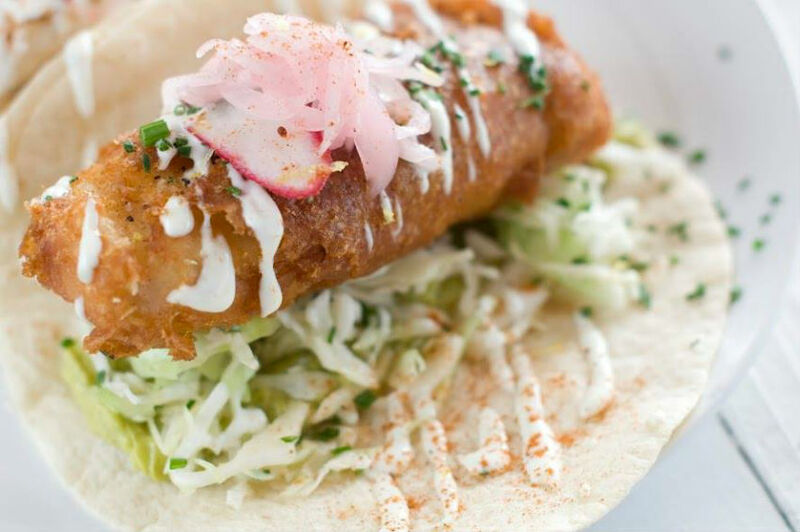 But what could be more American than our adopted Baja bite, the fish taco? Slapfish’s ultimate fish taco is a super-sized filet of tempura-battered or grilled fish with shredded cabbage, pico de gallo salsa, Mexican crema, and finished off with sriracha from the condiment bar. If you were’t able to make it out to Ricky’s Fish Tacos or Mi Ensenada, the ultimate fish taco will do just fine. Because, c’mon, you can’t leave L.A. without having a fish taco. I was sorry to see Kogi’s iconic truck go, but without skipping a beat, Susan Feniger and Mary Sue Milliken’s Border Grill Truck is a tasty consolation to taco lover’s looking for an original taste of Los Angeles, from two of its most respected chefs. Get a pair of the savory skirt steak tacos, or slow cooked Yucatan-style pork served organic beans and rice on corn tortillas to whet your appetite for a taco crawl when you arrive in Mexico. In L.A.—and throughout the country, actually—chefs are increasingly turning to the taco genre. While chef Ben Ford isn’t he first name that comes to mind when you think tacos, the chef/owner of Ford’s Filling Station understands this top L.A. dish as only locals do. Go with the grilled shrimp, Baja-style or the bright and tangy chile verde taco for an option not contrived by a chef simply following a trend, but a native Angeleno who’s been making tacos all his life. Visitors to Los Angeles can put Jimmy Shaw’s Loteria Grill on their itinerary for some excellent last chance tacos on their way back home, with flavors that should stave off taco withdrawals until the next trip to L.A. Loteria is known for their Mexico City-style guisados like pork rinds in green salsa, tinga de pollo (spicy chicken), and calabacitas (corn, squash and cheese) on handmade corn tortillas. Next articleAutonomous Cars are Coming! How Garcetti’s Prepping L.A.